By Souvik Chatterji, Master of Law from Warwick University, Coventry, UK. Master of Law from Case Western Reserve Univerwsity, Cleveland, Ohio,USA. Laxmikant Pyarellal emerged into the Indian film arena at a period when the main stream cinema was flooded with extremely talented music directors, lyricists and filmmakers in the 60s. Already the film industry has created its own unique standard due to the sheer brilliance of Musical Giants like Shankar Jaikishan, Naushad, Madanmohan, Roshan, Khayyam, Salil Chowdhury and many others and the versatile performance of Mohammad Rafi for over 15 years. Laxmikant Pyarellar the legendary musical duo included Laxmikant Shantaram Kudalkar (1937-1998) and Pyarellal Ramprasad Sharma (born in 1940). Laxmikant was quite impressed with Mandolin and learnt to play it by his own. He used to play mandolin in street functions. Pyarellal was the son of renouned trumpeter Pandit Ramprasad Sharma and his specialisation was violin. 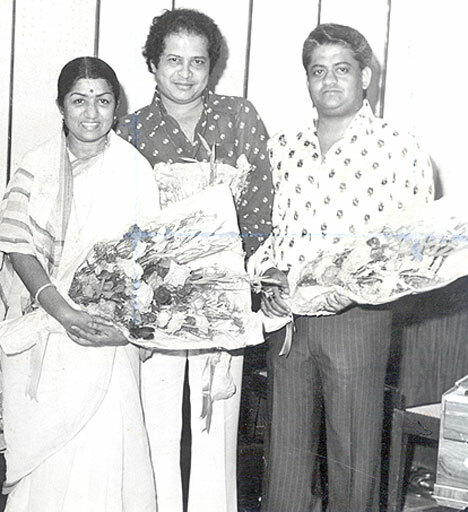 Laxmikant and Pyarelal met at Sureel Kala Kendra, a music academy for children, run by the Mangeshkar family. After Lata Mangeshkar came to know about their financially poor backgrounds, Lata recommended their names to different music directors in the film industry. Both of them started their career with the film Parasmani (1963). Two songs of Mohammad Rafi “Woh Jab Yaad Aye, bahut yaad aye” and “Roushan tumhi se duniya” brought fame for the musical duo. Laxmikant was fond of the orchestration of Shankar Jaikishan to such an extent that some of their earlier tunes were similar to a huge number of Shankar’s compositions. In the next film Dosti, 1964, Laxmikant Pyarellal got inspired by a very extraordinary standard of musical performance by Bengali music Director Robin Chatterji who composed music for the Bengali films Lalu Bhulu “ei pranjhorona jaglo“, 1958. The story depicted a blind boy and a his friend who did not have one leg. In the bengali film all the songs were sung by Manobendra Mukherjee who was a genius in hindustani classicals and has rich collection of Bengali modern songs, Kirtan, Nazrulgeeti and Bhaktigeeti. The notable songs include “Dukkho amar shesh kore dao probhu“,”Jar hiya akasher neel nilimaye“,”Ei pranjholona jaglo“.The striking part of the film was that no conventional hero or herione were depicted in the story, as the tragic story of the two handicapped friends was the central attraction. Laxmikant Pyarellal had a huge challenge to match the music of the bengali film and create the same standard of excellence. 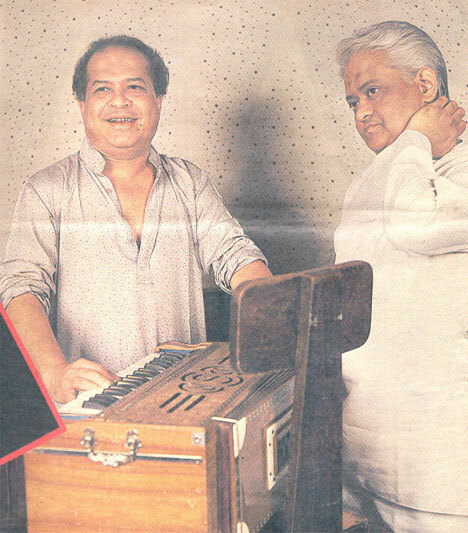 Both Laxmikant Pyarellal and Majrooh Sultanpuri sat together to compose the songs. The result was history. Rafi’s song “Chahunga mai tujhe saanj sawere“, “Mera to joh bhi kadam hai“, “rahi manwa dukh ki chinta kyun satati hai“, “janewalon zara” brought tears in the pandemonium hall. Rafi was so impressed with the compositions of Laxmikant Pyarellal that he had taken just one rupee for singing the song because it was the custom of a singer to take something in return for a professional song. The film became a huge success. Laxmikant Pyarellal won the filmfare award in 1964 for composing best music in a year when Shankar Jaikishan has composed songs for Sangam, 1964, Naushad had composed songs for Leader, 1964, Madan Mohan had composed songs for Woh Kaun thi, 1964, Roshan had composed songs for Aarti. From that time onwards Laxmikant Pyarellal never looked back and their everlasting bond with Rafi just grew with time. Their similarity with Shankar-Jaikishan is evident in the composition of the songs “woh hai zara khafa khafa” in the film Shagird, 1967 picturised on Joy Mukherjee and “Nazar na lag jaye” in the film Night In London, picturised on Biswajeet, 1967. These compositions had led to Shankar Jaikishan transforming their own style as people started getting mixed up with their compositions. But one factor was unique. The amount of affection Shankar Jaikshan had for Mohammad Rafi, the same passion was carried on by Laxmikant Pyarellal till Rafi’s death in 1980 as his last song in the film Aas Paas , 1980, was composed by Laxmikant Pyarellal. Dharmender and Jeetender had different story lines in the films of late 1960s and early 70s, but one thing was common. both had some of the extraordinary songs of Mohammad Rafi composed by Laxmikant Pyarellal. Examples can be “Hui sham unka khayal agaya” from the film Mere Humdum Mere Dost, 1968, “Baar Baar Din Ye Aye” from the film Farz, 1967. Besides LP pair had provided tunes sungs by Mohammad Rafi in the films of Jeetender namely Jigri Dost, Banphool, Humjoli and the hits of Dharmender namely Aya Sawan Jhumke, Jeevan Mrityu, etc. Lastly after the death of Jaikishan in 1971, Raj Kappor engaged Laxmikant Pyarellal for his films starting with Bobby in 1973. The song “hum tum ek kamre me bandh hai” had the same effect with the accordian as Shankar Jaikishan used to have in RK films. That led to LP pair ruling the film industry in the 1970s when most of the legendary music directors died and his only rivals included RD Burman and Kalyanji Anandji. In a very action pact scenario when the films of Amitabh Bacchan, Vinod Khanna had more concentration towards violence, LP pair created soft songs for Rishi Kapoor. Rafi’s songs “Dafli wale“, “Ramjiki nikli sawari” in the film Sargam, 1978 and “Parda hai Parda“, “Shirdiwali Saibaba” in Amar Akbar Anthony, 1977 and “Darde dil” in the film Karz, 1979, had brought filmfare awards for Laxmikant Pyarellal one after the other. He had tremendous combination with Rishi Kapoor and Mohammad Rafi and balanced romantic songs with the popular taste of film music. As they survived for the longest period of time, substantial number of Rafi’s songs are composed by them. So the creations of LP involving Rafi should be preserved in the archives where Rafi’s other songs are restored. This entry was posted on Sunday, September 2nd, 2007 at 5:06 pm	and is filed under Meri Awaaz Suno. You can follow any responses to this entry through the RSS 2.0 feed. You can leave a response, or trackback from your own site. Missing a lot Laxmi Kant Pyare Lal Ji…. When discussing Hindi film music, the names most often mentioned are Anil Vishwas, C. Ramchandra, Naushad, Madan Mohan, Shankar Jaikishan, O.P.Naiyyar, Sachin Dev Burman, Roshan,etc. L P duo entered the film industry at a time when most of the above composers were at their peak( barring a few). But inspite of this situation, this duo ( L P ) slowly but surely crafted a definite place for themselves and lasted in the industry for almost three & half decades. (Though their later year compositions – after 1985 – were not as impressive). I am a L P fan since my boyhood i.e. since about more than 45 years. Rafi sahab recorded his first song for this duo for ” Parasmani ” The song was ROSHAN TUMHI SE DUNIYA – SALAMAT RAHO”. The song was so much liked & appreciated by Rafi Sahab that afterwards – whenever Rafi Sahab met this duo he always used to wish them as ” SALAMAT RAHO “. My Name is Hemant Tattu, m 53 years of age, Residing at Pune – Maharashtra – India. I m ardent fan of old hindi film music and have, in my collection, around 24000 + songs. It was a real good feeling to see somebody have similar feelings about LP. Thanks and with warm regards. When two great talents meet and work as a team, fireworks ought to be expected. 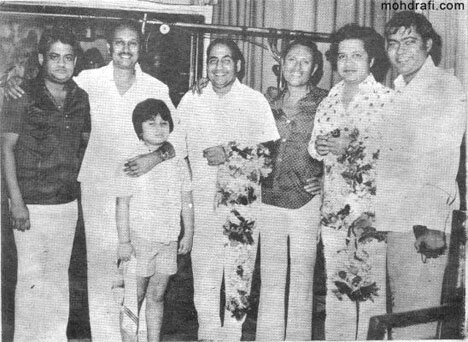 the team of laxmikant – pyarelal became the most durable music team in the hindi music scene. they were in thick and thin of hindi music for a span of 35 years . laxmikant was the pro of the music team. he was a mandolin player par excellence. and pyarelal, the quieter of the two was the silent behind the scene player. he showed his his skills and delivered most in the music rooms. pyarelal is said to be the best violinist in the country . he was chosen at age 17 to play the interlude by maestro madan mohan for the immortal song of haqueeqat : Mai ye soch kar unke dar se chala tha…………………, he could make the the violin cry! he is the best arranger of the industry, a little short tempered but a great artisan. its said that : when pyarelal has a rage then no one will come near him, including laxmikant his partner. like shankar jaikishan, the duo of l and p too had disagreements and fall-out was nipped in the bud. they also found favour with the nightingale who helped them in their career when the s.j team was seeing their downslide. its said that the nightingale flew in to a rage with their favourite composers after the duo gave ssongs to three female singers : when the nightingale was on a three month long world – in the nineties. its said that the duo recorded songs for over 400 movies . the total output was about one song – every third day of their career. mohd rafi was their main singer and gave him – utmost respect like that given by shankar and jaikishan. ( all composers had a special place for mohd rafi ). in short, laxmikant pyarelal composed all sorts of songs and in every decade they were a step ahead – of the competition. too many songs and films meant compromises with quality – but the duo have great nuggets of songs to their credit – to last a lifetime. I like LP songs very much . This is No. 1 Music director in 70 & 80 decade . LP music full fill script demand as well as popular . LP and great Lyricist Anand Bakshi combination was super hit. Anand bakshi was behind of success of LP music . LP had great seance to understand all kind of music . I can’t forget of this kind of music . Whole world remember LP music forever. LP has not only music it was magic. Thanks pradeepji for providing info about my favourite jodi LP. I like to thank Laxmikant-Pyarelal for giving us great songs with rafisahab, he sang many songs in L/P’s music, his last song was the film “Aas Pas”, recording before passing from this world. as an instrumentalist(as musician) in the orchestra of various music director in theire beginning and before joining with KA as an asst.MD. They groomed under KA and started with Parsmani as an independent MD with highly influenced by theire idol Shankar Jaikishan in all musical sense that in theire span of above 30 years carrier they creat many songs which were more or less equally resemble to SJ.Most of the SJ’s favourite producers switched over to LP in early seventies like mohan kumar,Ramanand sagar,J.Om Prakash,Nadiadwala,AVM. But before they started as a musician in the orchestra of various individual music directors like madan mohan ,ushakhanna,sj,roshan, they formed a small orchestral group with Hradaynath Mangeshkar,and usha mangeskar to perform in stage programme. In theire musical span of 35 yrs.they have given more than 25 golden jubilees,and over 100 silver jubilees to theire credits they have won 7 filmfare awards and 4 in row.and over 9 songs were topper in binaca geet mala. They employed rafi vocals from hulka pulka to rock,qawallis,bhajan,classical and various moods,same way with lata they used her vocals classicals,mujras,discoand even cabrat (AA jaane ja- intequam).LP had high respect and inclination towards rafi and lata. Thanks for the detailed analysis on LP success stories. 1. For a few years during the late 1950â€™s LP worked in Chennai (Madras) for several South Indian Music Directors because they could not get enough work in Mumbai. 2. When they first started in the hindi film industry as musicians (Laxmikant on mandolin) and Pyarelal on violin), they were so young (just 13 to 14 years old) that MDs Naushad, C. Ramachandra, Husnlal Bhagatram, SD Burman, Roshan and many others used to place them on stools on top of chairs in the front section, so that they could be seen by all members. 3. Laxmikant played in the orchestra of Shankar Jaikishan for many hit songs, but SJ never called Pyarelal to play the violin. 4. They assisted music directors Roshan, Madan Mohan, Hemant Kumar, Ravi, Bipin-Babul, Sardar Malik, Usha Khanna and many others during the early years. 5. They had a unique relationship with Music Directors Kalyanji Anandji. They were full assistant MDs during the recordings of Himlay Ki Godmein, Ishara, Ji Chahta Hai, Poonima, Bluff Master, Dulha Dulhan and Jab Jab Phool Khile. Once they started getting independent assignments, they slowly branched out with the blessings of KA. 6. Mohd Rafi and Lata Mangeshkar took a unique interest in the lads and helped them out a lot. Both the singers knew that LP where really talented and would one day become great music directors. 7. The â€œChahoonga Mein Tujheâ€ tune was composed much earlier than any Parasmani song by the duo. Many of the films that they signed before â€œParasmaniâ€ failed to be made and they were dejected with the hindi film industry. They could not find a situation in their early films to use the song properly. 8. The song was composed with Lata Mangeshkar in mind. They had such reverence for her that they wanted all their songs sung by Lata. During the musical sitting of â€œDostiâ€, Laxmikant sang this song out for Rafi at the very tail end of their session before departing Rafiâ€™s house â€“ as a song they kept in their pocket as a reserve. Majrooh Sultanpuri and Pyarelal were present. They were very apprehensive when they drove to Rafiâ€™s mansion early that day â€“ not knowing if the great singer would agree to sing for a low-budget movie and for such young, struggling MDs such as LP. As soon as they entered, Rafi put them at ease and was very cordial. 9. Having already been blown away by the Dosti numbers he had just heard, Mohd Rafi who was thrilled that he had three full solos that he agreed to sing for a small fee was completely bowled over by â€œChahoonga Mein Tujheâ€. He took this song and superbly rendered it for LP and told them that this song would be a big hit in Dosti. LP replied that there was no situation in the movie for this song. They did not want to use it. Rafi insisted persistently (while making the song greater every time he rendered it) and said that he would sing all the songs for free â€“ if â€œChahoonga Meinâ€ was included in the film. 10. LP returned back and had to make the writer, producer, director re-write the story to include â€œChahoonga Mein Tujheâ€ as a primary song in the film. 11. RD Burman played all the mouth organ pieces for Dosti. 12. The songs of Dosti were recorded including â€œChahoonga Mein Tujheâ€. LP concentrated on all their other numbers in Dosti and did not give any special care for this song. As we all know Rafi sang all these songs superbly, and Dosti is considered to be a landmark in Hindi Film music. 13. The movie was released and took India by storm in 1964. It was not just Mumbai (Bombay), but all across the country the songs of Dosti swept and swayed the masses. All the way from East-to-West and North-to-South, people would stand by radios just to hear the songs of this film. During the same year, Raj Kapoorâ€™s prestigious Sangam was released with music by Shankar Jaiksihan. People liked the Sangam songs, but the songs of Dosti overtook every other film. 14. Rafi Saabâ€™s prediction had come true. He moved even higher up in popularity and Laxmikant Pyarelal where catapulted to the forefront of popular Hindi film music and never looked back. LP won Filmfareâ€™s Best Music Director Award for Dosti in 1964. Mohd Rafi won the best singer award. The award was conveyed to them during the early morning hours on announcement day by MD C. Ramachandra (one of their gurus) who banged on their door and called out â€œGet up you donkeys. You have won !!!â€. They were bewildered â€¦won which award and from whom ? When they were told, they could not believe their ears. Shankar Jaikishan was their favourite MD and they had won over SJ. They had really arrived in the music scene. 15. Laxmikant emulated Jaikishan in every way. He was in awe of Jaikishan for many years. He dressed like Jaikishan (flashy expensive shirts, tight pants, collar up all the time), talked like Jaikishan and wore his watch on his right wrist. 16. Besides the songs of Parasmani and Dosti, Rafi Saab sang some beautiful early numbers for LP. Listen to â€œKhamosh Zindagi Koâ€ from Naag Mandir, â€œAbhi Kamsin Hoâ€ from Aya Toofan, â€œTumhi Se Hui Haiâ€ from Mere Dost, â€œShokiyan Nazar Mein Hainâ€ from Aasra, â€œJab Jab Bahar Aayiâ€ and â€œMujhe Bhool Jaanaâ€ from Taqdeer. All these songs use minimal instruments with Rafi Saabâ€™s beautiful voice and soulful rendering given prominence. 17. LP started moving more towards the SJ style of compositions with very large orchestration in the mid to late 60â€™s â€“ when they started getting movies with top hindi film producing companies like – J. OmPrakash, Subodh Mukerjee, Ramanand Sagar, LV Prasad, AVM Studios etc. who regularly used SJ, but were switching to LP because they were quoting lower rates and providing similar popular hit music. Films like â€œAaye Din Bahar Keâ€, â€œMilanâ€, â€œPyar Kiye Jaaâ€, â€œJaalâ€, â€œAnitaâ€, â€œShagirdâ€, â€œFarzâ€, â€œNight In Londonâ€, Pathar Ke Sanamâ€, â€œMere Humdum Mere Dostâ€, â€œMan Ki Aankhenâ€, â€œSajanâ€, â€œAaya Sawan Jhoom Keâ€, â€œSatyakamâ€, â€œIntaqamâ€, â€œDharti Kahe Pukar Keâ€, â€œRaaja Aur Rankâ€, â€œJawabâ€, â€œHumjoliâ€, â€œDarpanâ€ are some of their movies from 1966 to 1969. They really peaked between years 1966 to 1973. 18. The song â€œRam Kare Aisa Ho Jaayeâ€ from the film â€œMilanâ€ sung by Mukesh irritated the director LV Prasad so much that he supposedly told LP â€“ â€œget rid of this songâ€. â€œWhat is this ? Do you call this a tuneâ€. â€œBring Rafi in and give him some songsâ€. But LP convinced the director that this song and all the songs of â€œMilanâ€ would become big hits. They proved to be right. 19. LP (especially Laxmikant) had a very easy nature of placing singers and musicians at ease. He used to invite Lata and Rafi to the studios and before providing them the songs and tunes â€“ would put them at ease and crack a few jokes. LP knew Rafi and Lata since they were small boys; so they knew how to treat each of them with respect and reverence. One can imagine the atmosphere in the studios when Rafi and Lata sang numerous hit duets for LP. It would appear to a listener that they all enjoyed these recording sessions and found a lot of joy while singing these delightful LP songs. 20. LPâ€™s songs had that â€œwhole Indiaâ€ feeling about them. People in the North or East could find a strain of their regional folk music in their compositions. People in the south could listen to one of their great Rafi or Lata solos or a duet and thinkâ€¦the melody is catchy and feels as if it came from one of their villages. 21. They were able to adapt, adopt and polish their tuning and orchestration to move with the times and were so successful in doing this for over 37 to 38 years. Their legacy of Mohd Rafi songs are everlasting. I liked the rare photographs of l & P with manmohan desai I presume. can you please also give the photo credits? a big role in rafi saabs success post 1975 period. with rafi, lata,mukesh, kishore and a band of new singers post 1980.
trendy songs which the public lapped up. which the public failed to notice and appreciate. and success for their’ humanitarian gestures’. 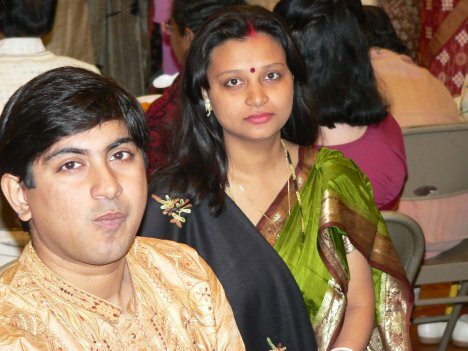 Binu Nair The rafi foundation. we are bollywood fans are so lucky that we got Md like naushand Ali,Madan Mohan,SJ,LP,Ravi and few more and singer like Mohd Rafi but today there is no 50% like them……………..
lp for some time became assitants of naushad? am i right? Pyarelal jis birthday is today : sept.3. and he is all of 63 years. and the event will be at london this year. has the trademark m a g i c of laxmikant-pyarelal. Laxmikant Pyarelal duo were the most consistent and lasted the longest in hindi cinema. They had melody in their music. Much has been said of Dosti & Parasmani songs, who can forget the melody of TAQDEER songs, JEENE KI RAAH & MILAN (Without Rafi saheb here). It is well known that RAFI Saheb not only encouraged them, but also helped them financially in their initial days. Greatness of Rafi Saheb, he conveniently forgot about it and I have heard that Rafi Saheb used to get irritated if someone tried reminding him about such gestures. I am tempted to rate SJ higher along with Madan Mohan Saheb, but melody wise duo of LP and master of melody and rhytham OP Nayyar could give SJ and MM run for their money. LP were the ardent fans & followers of SJ. Before, both of them were the assistants of Kalyanji- Anandji. As all of us know during 50 & 60s SJ were the most popular & sought after music directors. we can hear the prominence of Accordion, Violin & mandolin in SJs music. Lakshmikant being a mandolin player & Pyarelal being a violin player might have got influneced by SJs music due to major use of these instruments by SJ. Personality wise we can make a mathematical equation- Jaikishan is to Lakshmikanth as Shankar is to Pyarelal. Jaikishan looked freestyled similar to lakshmikanth. Shankar looked serious similar to Pyarelal. Mannerism wise jaikishan always carried a white napkin with him & often used to wipe off his face. Lakshmikanth followed the same pattern. Romantic melodies were the main musical creations for both the music directors. and to put life in these melodies Rafi sahab was the perfect architect. SJ were the mentors for Lakshmikanth Pyarelal & Rafi sahab was their fortune maker. After SJ (Shankar-Jaikishan) LP were the most successfull music duo in the film industry. Off course Rafi and LP are very much made for each other, because many of LP’s tunes can be delivered only by very high calibre singers like Rafi & Lata. LP have mixed the western music along the indian instruments maintaining the melody through out their career. As mentioned by Laxmikant in one of his interviews, that they change their orcestra once in 5 years. No wonder with no Rafi along with them the duo could manage to create incredible compositions in the 80s and early 90s. Pancham compared to LP is no match. This can be seen in the 80s when LP were using new singers like Alka Y, Kavita K, Shabbir K, Munna A, Anwar, etc. their success rate was incredible compared to any composer. Surprisingly they have not used the main singers like Lata, Asha, KK from mid 80s onwards. But their success was just great. LP were king makers for many artists through their incredible scores in the 80s and 90s. Rohini Agnihotri in Ek Duje Ke Liye, Meenakshi S & Jaikee S in Hero, Sridevi in Mr India, Madhuri D in Tezaab, Amitabh’s comeback in Hum, Khuda Gawaa & Agneepath, Manisha K in Saudagar, etc. No doubt bobby songs were hit but iread some where that RK had many songs tune made by SJ and kept in his own music and LP has to just conduct an orchestra to record the songs. In film like Khilona,jeene ki raah,himat,humjoli,man ki aankhe,mere hum mere dost,izzat,aasha,roop tera mastana,do bhai,AAkhri daao,etc etc were some of the best rafi – lp’s combo with jeetu and dhamu.